Do you know McCafe? A coffee line launched by McDonald’s? To simply explain, it has all kinds of fancy coffee drinks including cafe latte, frappe and cappuccino. Since it is served world widely, many of you may be familiar with it. 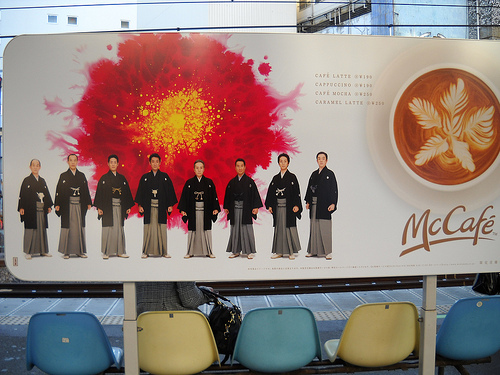 Today, I want to show Japanese McCafe commercial because it is so JAPAN! First of all, this is a commercial board of McCafe at a station. The men in kimono are the members of the Heisei Nakamuraza, which is a Kabuki troupe, founded by Nakamura Kankuro, one of Japan’s leading Kabuki actors. I think it is very artistic work because coffee and kabuki is a unique match. This is a recent McCafe TV commercial. They are just walking but it has punch, and even the coffee is cheap there, it doesn’t look so cheap with the famous kabuki actors! Hi, do you know the song name? Im happy to see Nakamura-san in a commercial again ^_^, thanks in advance.